Chef Arun Sampanthavivat opened Taste of Thai Town in Albany Park as a more casual outpost of his original fine-dining establishment, Arun’s. Lunch & Dinner daily. Taste of Thai Town, 4461 N. Pulaski Ave., Chicago, IL 60630, 773-299-7888. The brains behind the Radler have opened DAS in Logan Square, with a menu of kebab sandwiches and other crave-worthy street food. DAS, 2375 N Milwaukee Ave., Chicago, IL 60647, 773-276-0270. Brendan Sodikoff has opened Small Cheval, the second outpost of Au Cheval on Randolph. The new Bucktown location offers the restaurant’s acclaimed burgers in a counter-service, more casual setting with a 100-seat patio. Small Cheval, 1732 N. Milwaukee Ave., Chicago, IL 60647, no phone. The owners of Dusek’s and Punch House have opened Tack Room, a piano bar with upscale bar food. That includes Slagel Family Farm beef burgers and roasted chili churros. It's part of the latest expansion at Thalia Hall, a historic landmark in Pilsen. Dinner nightly. Tack Room, 1227 W. 18th St., Chicago, IL 60608, 312-526-3851. After a successful soft opening, The Windsor is now fully open in Streeterville in the former Elephant & Castle space. Just three months after opening Remington’s, Four Star Hospitality Group (Dunlays, Smoque Daddy) brings neighborhood-style service and menu developed by chef Todd Stein, with craveable dishes like slow cooked pork belly and boozy milkshakes. Lunch and Dinner daily, Brunch Sat.-Sun. The Windsor, 160 E. Huron St., Chicago, IL 60611, 312-943-7777. Restaurateur Brad Parker opened The Hampton Social in River North, serving up coastal cuisine like Maryland crab cakes, mussels and raw seafood paired with summer-themed craft cocktails in a 7,000 square-foot, 300-seat marine-like setting. 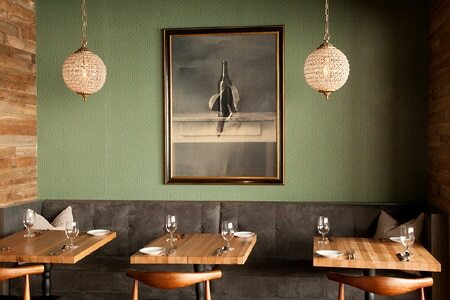 The Hampton Social, 353 W. Hubbard St., Chicago, IL 60654, 312-464-0500. Lou Malnati’s Marc Malnati and Kamehachi owner Giulia Sindler plan to open Buzz Bait Taqueria, a 30-seat, fast-casual fish taco and beer concept in Old Town, open for outdoor dining and dinner daily with lunch to come a few weeks after opening. Lunch & Dinner daily. Buzz Bait Taqueria, 1529 North Wells St., Chicago, IL 60610, 312-111-2222. Mara Baer and Manuel Moreno will open The Spanish Square, a European marketplace and restaurant, in Lakeview. While the market will sell jamón Ibérico, cheeses, wine and other specialty items, the restaurant’s menu will focus on inventive tapas. Dolce Italian has opened at The Godfrey Hotel, featuring a seasonally focused, authentic Italian menu developed by Bravo TV’s "Best New Restaurant" winner, chef Paolo Dorigato. Breakfast, Lunch & Dinner daily. Dolce Italian, 127 E. Huron St., Chicago, IL 60654, 312-754-0700. Chef Michael Taus is behind Taus Authentic Food & Drink in Wicker Park. A ricotta tart or braised octopus with chorizo and cannellini beans may precede lobster with oxtail ravioli or the lamb T-bones, eggplant gâteau and Brussels sprouts. Taus Authentic Food & Drink, 1846 W. Division St., Chicago, IL 60622, 312-561-4500. James Beard Award-winner chef Tony Mantuano revealed Café Spiaggia’s modern new look and revamped menu, including new desserts from pastry chef Melanie Diamond-Manlusoc. After a seven-week renovation, the cafe reopened on July 16, 2015, sporting sleek light fixtures, marble café tables, black chairs, white leather banquettes and brass fixtures. Café Spiaggia, One Magnificent Mile Building, 980 N. Michigan Ave., Chicago, IL 60611, 312-280-2750. Lula Cafe announced Sarah Rinkavage as the new chef de cuisine, after she spent five years with the restaurant. Kelly Helgesen is the new pastry chef. Lunch & Dinner Wed.-Mon. Lula Cafe, 2537 N. Kedzie Blvd., Chicago, IL 60647, 773-489-9554. Cyrano's Farm Kitchen is scheduled to close on August 31, 2015. Cyrano's Farm Kitchen, 546 N. Wells St., Chicago, IL 60610, 312-467-0546. Fiorentino’s Cucina Italiana, a rustic neighborhood Italian joint in Lakeview, has closed. Fiorentino’s Cucina Italiana, 2901 N. Ashland Ave., Chicago, IL 60657, no phone.